Butterfly Tenergy 64 rubber is a rubber that is extremely popular among the world’s top players. The Butterfly company defines this rubber as FOR SPEED. So, it is a rubber being made for speed and adopts the development number “NO.64”. The particle shape not only has the unique elasticity to the energy-incorporated technology, but it also uses a high-elastic sponge which is known as “SPRING SPONGE” to maximize the performance of the ball and the ability to spin and control the ball. By having this Tenergy 64 rubber on your blade, you can generate a powerful spin and fast speed. It is a high-performance super-speed rubber that has been recognized by the world’s top players. Why did I play the Tenergy 64 for so long? The Tenergy 64 is a very special rubber for me. 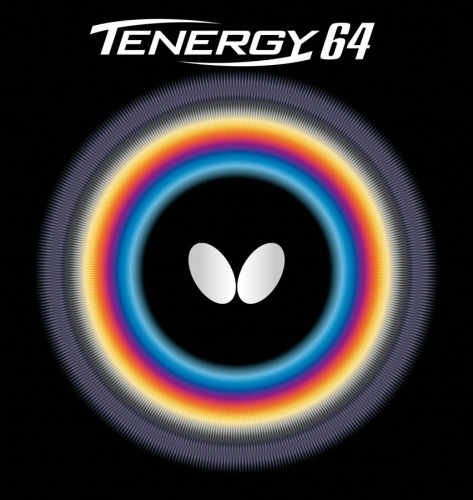 After the ban on glue applying on a table tennis blade on the spot before the tournament, the Butterfly Tenergy 64 was the first rubber I had on my racket. I was convinced by the incredible spin of the rubber. and also I am very overwhelmed with the spring sponge technology. Unfortunately, I’ve learned over time that although the Tenergy 64 has some really great features, it’s not suitable for me to perform well in the game. What I mean by that is self-explanatory, as I go into more detail on the rubber features and discuss which type of player a Butterfly Tenergy 64 is best for. As I have mentioned earlier that the Tenergy 64 has an incredibly high spin. The bounce and strength are just as good as the Butterfly Tenergy 05. These characteristics are mainly because of the unique dimpled geometry of the upper rubber. Or rather, it comes together with the Tenergy sponge that can give players a lot of energy and power. Although all Tenergy rubbers have the same sponge, the dimpled geometry determines the direction of the ball. And the longer and thinner pimples will give you more precise direction. As a result, there are various advantages and disadvantages. The rubber can produce higher tempo which ensures the Tenergy 64 can develop its full strengths, especially from the mid-distance. The rubber also supports a fast and uncompromising attacking game. On the other hand, a Tenergy 64 can also produce less spin than its counterparts. The Butterfly Tenergy 64 is rather difficult to control. Nevertheless, it is good at playing the block game with the increased bounce that the rubber can give to the player. The pushing can also be a little hard to control. If you have your racket in a certain angle, you can accidentally pop up the ball and give your opponent a chance to smash on you. You need to learn to control the push to keep it low. As mentioned earlier, this rubber is not for the defender. If you try to chop with this rubber, you will find it is not consistent and can easily go long off the table. You can buy this rubber at Megaspin. The question has often come to my mind lately. Because I am a player who needs spin and speed. And in the game, I draw my topspins mostly from the short and middle distance. I can play mid-distance, but that’s not what happens most of the time, because I’m not pushing back. The answer is probably a mistake that many people make. When playing with this rubber, it has a positive effect on my game. I can have a fit stance in playing topspin from the mid-distance and also with fastball blocking on the fast play-in spin. I can do all that with the Butterfly Tenergy 64 very well. But in the tournament, this can be a killing for me. Since I put more effort on spin, the change of the bounce and table attacking from this distance can make a great impact on my return. This can cause me to lose in the game. The top sheet can be very tacky. If you are a defender, it is not recommended at all for you to get this rubber as it is means from straight attacking. The main selling point of this rubber is the speed. The speed you can get is as fast as hell. Spin is decent for me. It is not super spinny but still can give you a lot of spins you want. The control is also decent. When I first played with this rubber, it is very bouncy and gives me some hard time to control. When I do a regular hit for the first time I use this rubber, it was very bouncy which make me miss the table for a few times. However, after a few hours of getting used with this rubber, I would say this rubber is straight up a fire that can be super fast. Once you know how to manage it, it will improve your game very much. If your opponent hit a high ball to you, you can simply rip through it and your opponent will have no chance to return it. The Butterfly Tenergy 64 is a fast, dynamic rubber for fast topspin play, especially in the mid-distance. This rubber is suitable for players who are looking for their luck more in the bounce than in the spin. Still, a Tenergy 64 has a lot of spins, but not as much as a Tenergy 05 can offer you. The performance of the rubber is excellent. It becomes a high-elastic and high-friction soft rubber when it is combined with the 2.1mm thick of soft sponge with special bonding. The rubber sponge is softer than the DHS Hurricane 3. The sponge has good elasticity which can perform faster speed, stronger friction and better control of the ball. It is an excellent rubber in the aspects of doing spinny serve, controlling short ball, hitting the ball in the table, smashing, counterattacking at the front table, hitting the ball in the middle, defending and controlling.